If you have a new baby or young iguana, you have a choice, give it the wrong things (even though you are giving it what the pet shop told you or what mistaken ideas you got) and watch it suffer and die while it's bones bend and break within a few short months OR you can give your iguana the things it really needs, so your baby or young iguana will develop and survive well with healthy strong bones, the biggest problem facing young iguanas. If you want to kill your iguana, than keep feeding your iguana with only food items such as lettuce, green leaf or Romaine, as these items have little or no calcium and the bones will have no chance to form properly, and they will bend and break in a few short months. Even though the iguana looks great now, if you continue only feeding calcium poor things such as lettuce, green leaf or Rommaine lettuce, these are too low in calcium, the iguana will suffer deformities, which can get worse and kill the iguana. 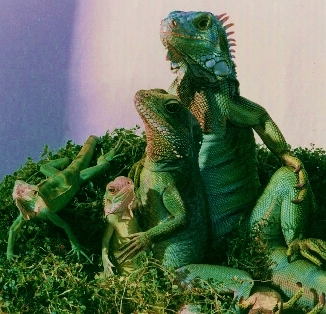 There are too many iguana owners that buy a "special reptile light bulb" at the pet shop that's a "basking light" for the iguana to bask in, thinking the light bulb is providing UV rays, that the iguana needs to generate vitamin D.
Your iguana also needs enough heat during the day time hours so it's body can get up to about the same temperature as a human's body, the iguana needs to reach a body warmth in the 90 to 98 degree range, BUT the iguana also needs to be able to get away from the heat in order to cool off and rest, in a temperature range that's also comfortable for humans, in the upper 70's range, ideally from 75 to 85 degrees. c) Provide safe direct sunshine (NOT through glass, blocks out the vital rays) OR provide a true UB-B light (NOT a so called "reptile basking light"
You have to provide some occasional direct sunshine OR a true working effective artificial form of sunshine, also known as UV-B.